As an all-inclusive media solution, Leawo Total Media Converter Ultimate has been one of the most top-rated media converter toolboxes globally. Comprising ultra-high efficient video converter, Blu-ray Ripper, DVD Ripper, Blu-ray Creator, DVD Creator, Free YouTube Downloader and online Video Accelerator, this comprehensive media converter suite breaks the format limit of different media files and enables you enjoy movies at your own will. Leawo Total Media Converter Ultimate helps you easily convert videos between various formats like MP4, AVI, 3GP, FLV, F4V, M4V, RM, MPEG, etc., convert Blu-ray/DVD to video and audio, burn video to DVD/Blu-ray, download online videos from various video sharing sites including YouTube, Google, Yahoo, Myspace, etc. With the up-to-date support of Windows 8, Leawo Total Media Converter provides more options for you to enjoy movies, rather than on your PC or computer any more. Being a professional total media converter combo, Leawo Total Media Converter Ultimate allows you to watch movies in the way you like, no matter they are HD video, DVD movie, Blu-ray movie or videos online. This all-inclusive 7-in-1 media file converter is video converter, DVD converter & burner, Blu-ray converter & burner, online video downloader and video accelerator. It could convert your video, DVD and Blu-ray to more than 100 formats like AVI, WMV, MP4, MKV, FLV, 3GP, MPG, etc. for various trending players and devices such as iPhone, iPad, Surface, Galaxy S series, Windows Phones, etc. Meanwhile, burning video to DVD or Blu-ray is also enabled, with abundant of disc menu and templates available. Including online video downloader, Leawo Total Media Converter Ultimate allows you to download online videos and movies to computer, or even convert online videos to your handheld players for on-the-go enjoying. You can download online videos from YouTube,dailymotion.com, metacafe.com, blip.tv, veoh.com, liveleak.com, videobash.com, funnyordie.com, aol.com, break.com, vevo.com, etc. Also, working as online video accelerator, this toolbox could accelerate the online video playback loading so as to provide smooth video playback. 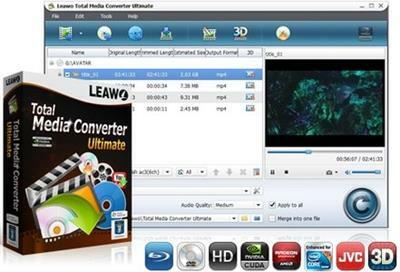 Acting as popular 2D to 3D converter, Leawo Total Media Converter helps you easily create 3D movies out of 2D videos, DVD, Blu-ray and online videos. You can create 3D videos and 3D DVD/Blu-ray discs as well. 6 types of 3D effects are available: Red/Cyan, Red/Green, Red/Blue, Blue/Yellow, Interleaved and Side by Side. You can also set the 3D depth to adjust the 3D effect. User-friendly personalization features are provided by Leawo Total Media Converter Ultimate to enrich your movie enjoyment. It allows you to edit source DVD, Blu-ray, online video and movies with useful video editing features: trim video length, crop video size, adjust video effect and add image or text watermark. Meanwhile, during burning video to DVD or Blu-ray, you could DIY the disc menu, template, background music and image.